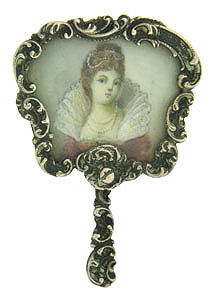 A porcelain skinned Victorian beauty is the focus of this beautifully painted antique portrait pin. Dressed in high style with starched lace high collar, she is adorned in pearls at her neck and wrapped in her curling auburn hair. The portrait is framed by an intricately engraved fan shape design, and finished with a simple pin back. 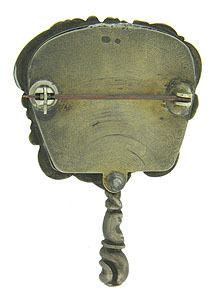 Fashioned of sterling silver, the antique pin measures 1" wide, 1" long. 18th Century.